Display this set of antiqued silver leaf wall mirrors grouped together, or hang them individually in one room or up to three. This hand-applied, antiqued, and burnished silver leaf wall mirror set of three has a sophisticated look that blends elegance with rustic appeal. Rectangular, solid pine wood frames have a gentle ribbed texture and an individual hanger is included on each. May be hung horizontal or vertical. From Uttermost. Each mirror is 13 3/4" wide x 19 3/4" high x 1 1/2" deep. Hang weight is 18 lbs. Glass only section is 12" wide x 18" high x 1/4" deep. Surrounding frame is 1 3/4" wide. Set of three artisanal-rustic wall mirrors from Uttermost. Can be installed vertically or horizontally. Hanger included on back of each. Antiqued, burnished silver leaf finish frame. Ribbed, solid pine wood frames with MDF backing. 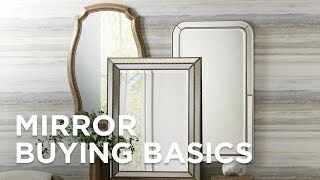 Are the mirrors antiqued? Or just the wood? BEST ANSWER: Hi Linda - Per the manufacturer, the mirrors themselves are also antiqued as shown in the picture. Add a decorative detail to bolster any space with this Bounty rectangular arched floor mirror. A sleek chrome finish and beveled glass add sophisticated style to this small rectangular vanity mirror. Luxe Flush Mount Nickel 20 1/2" x 25"
Accent any room with the lovely look of this mall satin nickel framed rectangular flush mount wall mirror.